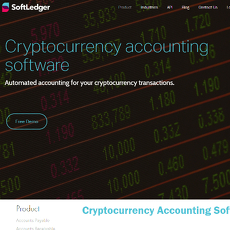 5+ Cryptocurrency Accounting Software - Cryptolinks - The World's Best Cryptocurrency Sites List! Crypto accounting services are arising to fill a key need that users of cryptocurrency are increasingly facing. How to file taxes is a challenging issue for cryptocurrency users. 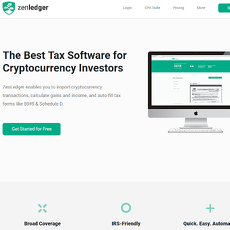 With there being many different jurisdictions and regulation still being in the elementary phases of being developed, users stand little chance of organising all of their cryptocurrency taxes alone. This category reviews the key accounting solutions that users can consider for organising taxes. There are five reviews in total for this category, each with their own strengths and weaknesses. The accounting treatment for taxing cryptocurrencies varies per jurisdiction. Many areas are still not taxing cryptocurrencies and others are currently developing their tax policies. The United States has one of the most advanced policies and actively stresses the importance of those involved in the cryptocurrency markets to file their taxes. The services reviewed cater for a number of different jurisdictions. One of the solutions can be used globally whereas another is focused on the United States alone. Pricing is going to be one of the biggest considerations when it comes to accounting solutions. The reviews take fees into account as a key point. The service that can be expected for the fees will also be detailed. Some services will be a fully tailored and personalized solution that will be priced higher. These solutions are likely more suitable for traders with higher amounts of capital who are participating in multiple markets with multiple exchanges. 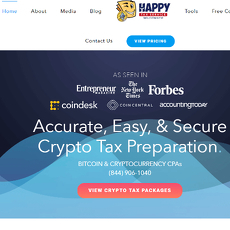 For example, CryptoTaxPrep consists of a full team of Chartered Public Accountants that provide a fully tailored solution for customers. This service is priced far higher than alternatives but does contain a number of tiers within their services depending on the customer's needs. Other solutions will be a software solution where users have to import their own records and the software provides an exportable report to be used for tax reports. The fee model will be detailed in the reviews so users can easily find out what they can expect from the service for the cost. This also includes a detailing of whether there is a free tier and what can be expected from the free tier. In terms of software, the technology varies and there will be different capabilities and limitations from different software solutions. Some of the software solutions only support a limited number of exchanges. 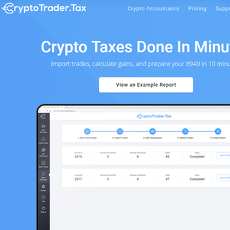 For example, CryptoTrader.tax only supports six of the major exchanges meaning that more advanced traders that may be participating in many different exchanges and potentially derivatives markets would need to consider different solutions. This information will be detailed in the reviews so that readers can quickly rule out services which will not fit their needs. For users that are able to link API’s, the reviews will also detail which services enable the linking of APIs. Potential customers will vary widely in their requirements for these solutions. Some will have simply bought and hold Bitcoin and are looking to tax their capital gains. Whereas others may have participated deeply in altcoin markets and intraday trading, making multiple trades per day on different exchanges in many different products. The second potential customer's case will be far more complex than the first potential customers and in terms of software solutions, the customer would need to find a software which supports the products, the exchanges, and the jurisdiction they are in. The reviews will include a briefing on what kind of support can be expected. Does it cater to a wide variety of exchanges? Is it limited to just a certain number of cryptocurrencies? Is it a global solution or is it only for a limited number of jurisdictions? All this information can be found in the reviews. Most of the reviews included in this category are accounting solutions whose sole focus is cryptocurrencies. However, one of the services offer cryptocurrencies as one part of their service but it is not their main focus. This was taken into consideration when providing a star rating. Another important consideration was former customer reviews voiced on online forums such as Reddit and BitcoinTalk. These forums were examined for user reviews of the service and the general sentiment is included in the reviews when important to note. Not all of the content on these forums can be trusted but they serve to paint a picture of what customer experience was like with these services. The services also vary in their length of operation. Some of the services are very new and have just been released in 2017 such as ZenLedger. 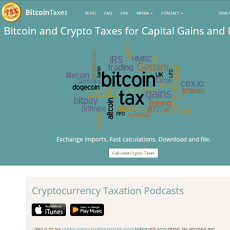 Others have been operating for years such as BitcoinTaxes which has been operating since 2014. The length of operation was factored in for the reviews and also into the star-rating these services received. Overall, accounting in the cryptocurrency field is going to be a growing area as more and more governments catch up their policies to the market environment. At the moment, this category only contains five reviews but it is bound to grow as more and more services venture into the cryptocurrency space. At the moment, the reviews included in this category offer a wide range of services which can cater to most users needs. They range from simple software solutions to fully personalized solutions with different price ranges and strengths and limitations. These reviews aim to make the readers choice easier when finding out which solution is for them.